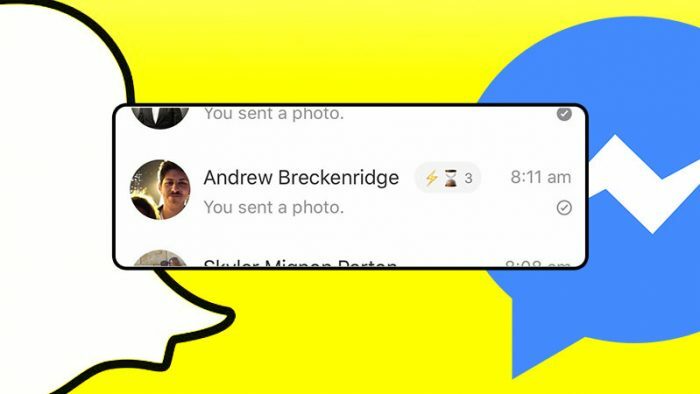 Facebook is now planning to copying the Snapchat streak and rechristening it as Messenger streak. At times Facebook feels slightly more accommodating, and I want to say ashamed but that ship has sailed. They do change the name of identical features they clone and copy but today is not one of those days, and they are calling it streak. The Messenger streak feature is currently being tested by the social media platform pac-man and was first spotted by Twitter user @CaseSandberg and reported by Mashable. I understand things might be slightly hazy for you to recollect about how many Stories clones Facebook owns, and what they’re called. So it’s Messenger Day, WhatsApp Status, Facebook Stories and the trailblazing Instagram Stories. “A spokesperson for Facebook Messenger confirmed the test saying it was a way to “to see at a glance fun facts about the people you message with.” Mashable reports. The lightning bolt that you can see before the hourglass icon, appears when you message a person for atleast three days in a row, and the number will be depicted to show the number of days you have been consecutively chatting with the person. Snapchat users are known to obsess over streaks, going as far as sending blacked out Snaps just to maintain a Snap streak with their best friends or significant others. As you can see, Snap streaks are important. VERY important. To the people that let my streak die, you don't even have to snap me Happy Thanksgiving.. There is a loophole with Snapchat, but will Messenger too reinstate streaks? If it’s ever introduced officially and manages to find any takers that is. As you can see, streaks are definitely an integral part of social media bragging rights and this move could have been motivated by Facebook’s failure to entice millennials. Now can Messenger streak capture the same amount of faithful streak-maintenance? I find it highly unlikely since Messenger is not really anyone’s first choice of an Instant Messaging platform, and is more of the insufferable family member that you just have to deal with at times.